Pickup Cab Wing Angle - Measure from Where? 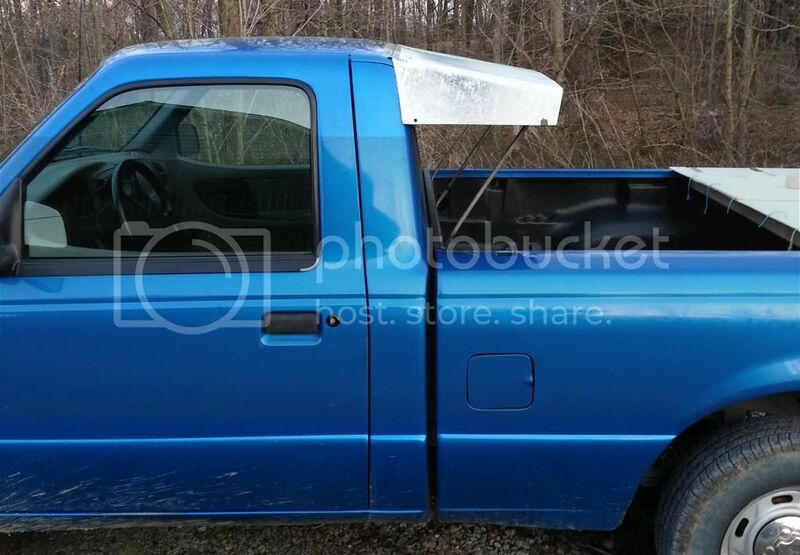 I'm modding a '99 Ford Ranger and need help setting the correct angle of the wing. 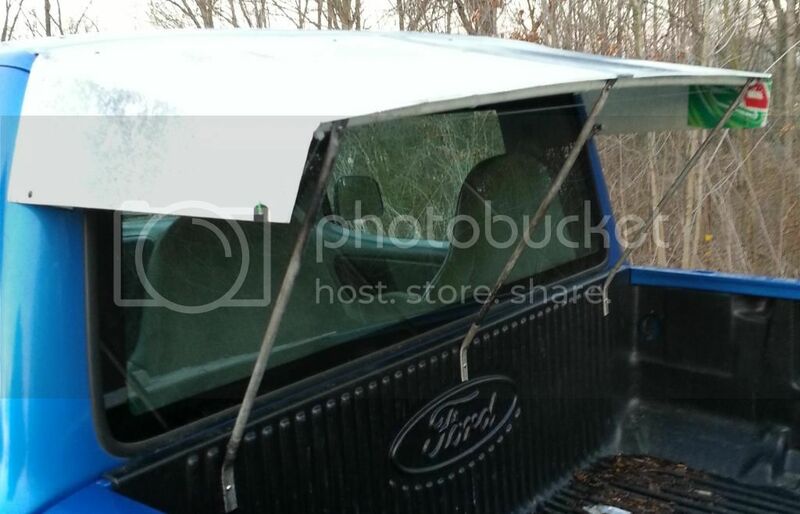 I read in a post here that a 12 or 11 degree wing approx 19" wide used in conjunction with a half bed cover on a short bed truck would give close to the same benefits as an aerocap. My truck has a 6' bed and an 18" wing, but my question is where do I measure the 11 degrees from? The top of the cab is a gentle curve, so that's not much help. I ended up parking my truck on a level surface and then using a gauge with a bottom-weighted needle to get my 11 degrees. I ran a string along the top of my wing and the string passes 7" over the top of the tailgate. Edit: Now that I look at my pics I can see that any movement between the bed and cab is going to damage the wing. I'll make new support poles and run them to the cab near the bottom corners of the window. ..........I ran a string along the top of my wing and the string passes 7" over the top of the tailgate. It's looking good, you might be the first in the forum going this route, as my effort has a leading edge slot and no angle at all. The 7" should be fine, although I'm not sure what Texas Tech and others have used. If you had a rear spoiler at the end of your tailgate for down-force (like mine), then I could see increasing the angle to engage it in the flow. I'll make new support poles and run them to the cab near the bottom corners of the window. Good idea, although isn't that wing spoiler hinged connected with duct tape/foil tape? If you had a rear spoiler at the end of your tailgate for down-force (like mine), then I could see increasing the angle to engage it in the flow. I'm actually getting some down force at the tailgate. My plastic bed cover ends just short of the tailgate and at speed I can see the plastic flexing downward about half an inch. The wing is bolted on with six brackets. The tape is just to seal the gap and smooth the transition. I need to do some research on testing. In my estimation, you'd be better off being too flat rather than too steep. What you have seems right, I certainly would not go steeper. If too steep, it would create a large vortex due to the downwash from the top hitting the air coming in from the sides which would then be sucked in and set to whirling, this type of vortex would be like adding a drag chute to your truck. Not good. Shooting from the hip,the 7" sounds 'bout right with the short bed. Project looks mpg to me! Yeah, trucks are work vehicles, not ego-boosters. So aero changes are like a rotating amber warning lamp . . something is happening! Gets my attention every time (as in, is that an "edge" that can be exploited). Hard to make money with a car. Not so with a pickemup. Just posting this in this thread because it was the last roof wing thread. Looks like a nice drag generator more than anything else, but maybe something someone wants to get involved in. I taped four rows of tufts to the bed cover. The leading row (nearest cab) was pulled forward and down strongly while the remaining rows were pulled backwards but wagged side to side. I waited for a very windy day (30 ish mph), parked my truck into the wind, and threw handfuls of sawdust on the windshield and watched it flow it over the cab. After flowing over the wing the sawdust took a sharp turn downward and a lot hit the leading edge of my bed cover, with the bulk of it hitting the bed cover and flowing off the back. I then changed the angle of my wing to about 7 degrees. This equates to about 11" above the tailgate. The wind and my free time haven't coincided since, so I sort of repeated the sawdust experiment by having my wife release a handful of sawdust as we were driving down the road. The sawdust now missed the bed cover and passed over the tailgate a few inches above it. The tufts now show the leading row of tufts to pull weakly forward and slightly down. The second row flops around but mostly rearward, and the last two rows are pulled back fairly strongly. So what did this do for mileage? Don't know. I had to replace the EGR feedback sensor and the spring weather has been erratic so I can't be sure. My next step is to build adjustable supports, find a long hill, and do some coasting tests at different angles. May also build a rig to release sawdust/flour/cornmeal ahead of my windshield so I can see airflow as I drive down the road. I waited for a very windy day (30 ish mph), parked my truck into the wind, and threw handfuls of sawdust on the windshield and watched it flow it over the cab. I wonder if anyone has used a leaf blower? Interesting. I'll borrow one and give it a shot.